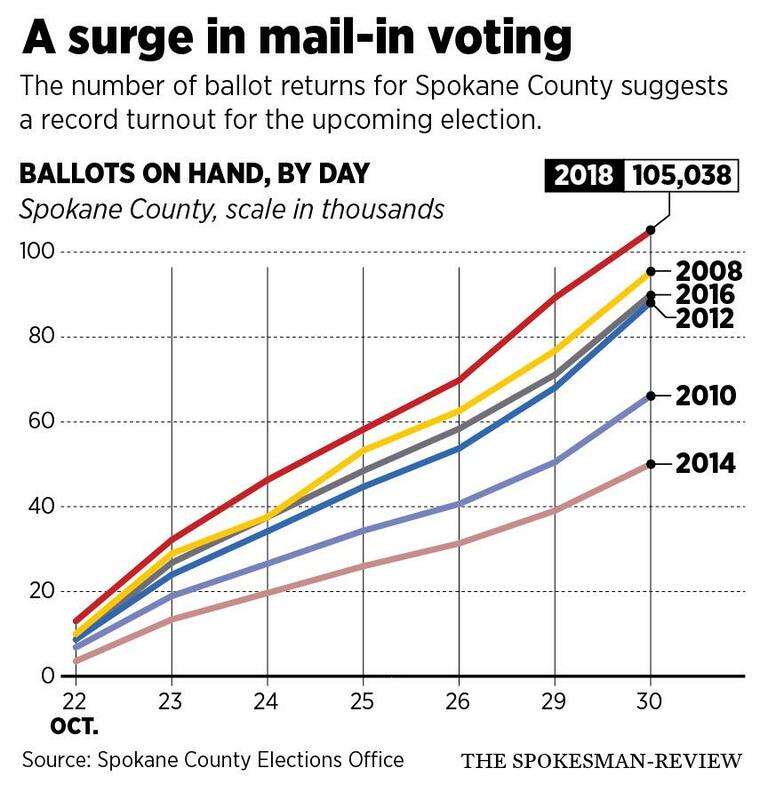 UPDATED: Tue., Oct. 30, 2018, 7:21 p.m.
Spokane County voters continue to send in their ballots in record numbers, with the totals received through the mail and from drop boxes topping 105,000 earlier than any previous election. That includes presidential elections as well as midterm elections such as 2018. On Monday, returns hit 19,499, which was the most for any day more than a week ahead of an Election Day. “Yesterday was a good day,” County Elections Manager Mike McLaughlin said Tuesday. The daily returns dropped slightly Tuesday to 15,729 ballots, but that was still the seventh weekday in a row in which the number of ballots received in the office topped 10,000, which is another record for Spokane County. Ballots aren’t counted on weekends. Unlike previous elections, the state is paying for the return postage on ballots, which is a possible factor in the heavy mail returns. Ballot returns were up for the August primary, which also had prepaid postage. The county also has a hotly contested congressional race, and the statewide ballot has several controversial ballot measures and a U.S. Senate race. There’s no way to tell if the returns will continue at this record pace. The majority of returns usually shift from the mail to the drop boxes on Election Day and the day before, he said. Ballots mailed on Election Day will be counted after they are received, but only if they are postmarked by Tuesday evening. Published: Oct. 30, 2018, 6:47 p.m. Updated: Oct. 30, 2018, 7:21 p.m.